A friendly harbour for globetrotters! The Hotel Trst is situated in the very centre of Bled and attracts travellers from all over the world. This small-scale hotel boasts more than one hundred years of tradition as it stands on the site of the Wönfling hotel that was built in 1900. Its central location means that it is an excellent starting point for exploring the sights of Bled, take walks or go on interesting trips. This cosy hotel is chosen by guests who mainly require accommodation and want to get other services elsewhere while exploring Bled and its surroundings. Are you looking for standard accommodation at an affordable price in an excellent location? Then the Hotel Trst is the right choice for you! The Hotel Trst is a smaller hotel situated in the very centre of Bled and in the immediate vicinity of Lake Bled. This three-storey hotel offers 28 rooms, each with a TV set. All the rooms include an en-suite bathroom. Hotel guests can take their breakfast at the nearby Hotel Park (7.00–10.00). Lunch and dinner are available at the Panorama Restaurant (80 m) or at one of the hotels in the immediate vicinity. The swimming pool complex at Živa Wellness offers 6 swimming pools: 4 indoor thermal swimming pools, an outdoor thermal swimming pool, children's thermal swimming pool, indoor waterslide and hot tub. Saunas at Živa include 3 Turkish saunas, 3 Finnish saunas, 2 cold swimming pools with a water temperature of between 14 and 21 °C, experience shower. There is a bar next to the swimming pool. Sauna opening hours: summer (2 May–31 October) Mondays through Thursdays: 15.00–21.00, Fridays: 15.00–23.00, Saturdays: 12.00–23.00, Sundays: 12.00–21.00 / winter (1 November–1 May) Mondays through Thursdays: 12.00–21.00, Fridays: 12.00–23.00, Saturdays: 10.00–23.00, Sundays: 10.00–21.00. Swimming pool opening hours: Sundays through Thursdays: 7.00–21.00, Fridays and Saturdays: 7.00–23.00. The Živa Wellness boasts a wide range of massages, wellness programmes with an Alpine twist, baths, facial care using established cosmetic brands, spa programmes for young people, beauty treatments and other care programmes. We recommend that you schedule your time slot in advance. Opening hours are each day from 8.00 to 21.00. Just 3.5 km from the hotel, you will find the Royal Bled Golf Course with the 18-hole King's Course and the 9-hole Lake Course. In addition to the two courses, it offers a large practice putting green, a golf academy, a Pro Shop selling golf equipment, locker rooms for guests and an equipment storage facility. The King's Club House is also located on the golf course. During the season (March–November), the course is open from 7.00 to 22.00, while it follows sunrise and sunset in the spring and autumn and is open from dawn till dusk. The hotel is situated in a highly convenient location in the vicinity of the lake. When travelling from Ljubljana, leave the motorway at the Lesce/Bled exit. Take the second exit at the first roundabout. Continue along this road to Bled. When at Bled, go down the hill to reach the lake shore where you will find the Hotel Trst among the buildings on the left. Ljubljana is 54 km away, Trieste is 144 km away, Venice is 290 km away, Munich is 360 km away, Graz is 220 km away, Vienna is 378 km away, Budapest is 515 km away, Zagreb is 198 km away, and Belgrade is 588 km away. The nearest airport is the Letališče Jožeta Pučnika airport, which is 35 km away. Klagenfurt airport is 65 km away. The bus station is 800 m away and the railway station is located 3.5 km from the hotel. Rules on cancellation and prepayment vary depending on the room type or package. Please check upon making the reservation. Comfortable double room with a 180 cm wide bed or two separate 90 cm wide beds. The room (15 - 20 m2) features a bathroo with a bathtub or shower and toilet. Comfortable single room with a 90 cm wide bed. The room (8 - 10 m2) features a bathroom with bath or shower and toilet. Hotel Trst: A friendly harbour for globetrotters. 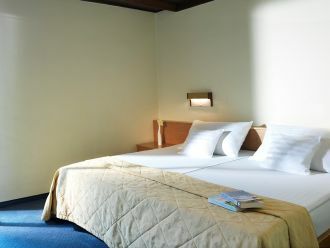 Hotel Trst is a situated in the very centre of Bled and offers quality accommodation at an accessible price. This is an excellent starting point for the exploration of Bled and its surroundings. 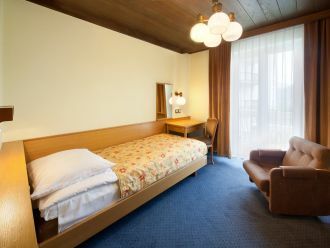 The rooms offered by Hotel Trst in the centre of Bled are intended for guests who are primarily looking for accommodation. Half of the rooms face the ...lake and the other half overlook the park. The main advantage of the rooms is their standard quality at an affordable price, while the hotel's central location means that guests can start their sightseeing tour of Bled on foot. Breakfast buffet, and optional lunch and dinner are available to Hotel Trst guests at the Panorama Restaurant, which is just a few steps away. The Pan ...orama Restaurant offers an amazing view of Lake Bled so we suggest you choose a table by the window. Its specialty is Slovenian dishes – select them from the menu or ask the serving staff to recommend a dish to you. The restaurant offers various daily special offers to hotel guests and Bled visitors. The guests of Hotel Trst receive a discount on tickets to the swimming pool complex at Živa Wellness, which has the largest swimming pools in this par ...t of Slovenia. The pools offer a magnificent view of Lake Bled. They are filled with thermal water. At Bled there are several springs of thermal water with beneficial effects on well-being. Pools on two levels with an indoor waterslide are also suitable for families. Guests can enjoy light and aromatherapy treatments at the saunas and cool down in the outdoor cooling pool or jump in the whirlpool and enjoy the most beautiful views.